The One World curriculum was developed in partnership with students. It is an evolution of arts education driven by the realities of the 21st century arts community and by the needs and aspirations of young people who desire to participate in that community and in our global community as a whole. The One World curriculum can be delivered as the foundation for an existing program, typically Music and Computers (AMM 3/4), or it can be adapted to be offered as a part of other music programs (eg. AMU) or co-curricularly. This course develops students’ artistic knowledge and skills through the creation of music and the preparation of music productions. Students will create appropriate works, particularly works in contemporary popular styles. Independently and in groups, they will also plan, market, and produce music productions, making use of appropriate technology, and will evaluate the results. Social Justice, Equity and Character Development are the most important themes of One World. Students in this program will explore the value of artistic creation (beyond the aesthetic) as a means of participating in the advancement of the individual and by extension, the advancement of our global community through the creation of music and artistic productions that support values consistent with those of a civilized, caring society. One World is an outcome-based program that marries the art of music creation with the art and science of music recording. This course will be of benefit to those students who are interested in the performance and creation of music and who wish to record their music as professionally as possible in order to share it with a world-wide audience through the creation of music CDs and formats suitable for internet promotion and distribution. Participating students will take parts 1 and 2 consecutively in order to complete some of the broader outcomes and expectations in a logical progression. Enrichment, coop and extension courses will enable students to participate in the One World program for more than one year. 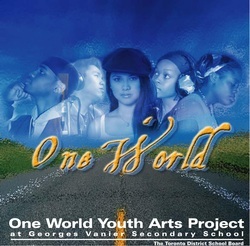 The One World program is intended as an extension of the general Performing Arts program. Students enrolled in this program are expected to enhance the school's Performing Arts program through cross and extra-curricular participation. The performing ensembles from the Performing Arts department will be used as sound sources for the Music and Computer courses and it is in the interest of all participating students to direct some of their energies to the support of these groups and to the support of the Performing Arts department as a whole. A portion of the students' evaluation may be derived from participation in extra-curricular ensembles and/or other performing arts initiatives such as performances, excursions, fund-raising and arts executive membership. Experiential learning is a cornerstone of this program. Through partnerships with the community and industry, students will develop knowledge, skills and associations that will enhance their choices beyond high school. Coop, internships, school-to-work and other means will be incorporated to ensure that students will be able to negotiate a smooth transition from high school to work, internships/apprenticeships and post secondary education.